My mother gave me my first bottle of Chantilly on my 13th Birthday (turned a teenager! ), and I haven't stopped wearing since (I am now 68 YO). Everywhere I've gone - either to work, church, school, grocery shopping, etc., it doesn't matter, I am always asked what I am wearing from men and women. I LOVE IT!! Please don't quit carrying it. Hope to see a lot more of it!! 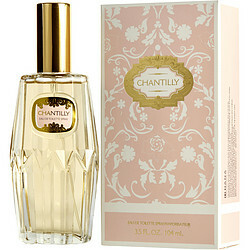 Absolutely love my Chantilly edt such a wonderful romantic fragrance. Would definitely recommend this product ! Chantilly has been one of the smells of my life, my grandmother Kitty wore it exclusively and it has always reminded my of her. I love putting it on and all the memories it invokes, it is one of my go to scents. I ordered this for my mom. I'm pretty sure she'll love the smell of chantily. I had it before and I like it. It came fast. Thank you!